I really wanted to get a fake tree, thinking it was more environmentally sound, but was appalled by the toxic nature of all fake trees I researched. So until I can find a tree that won’t kill us slowly, we will opt for a real tree. 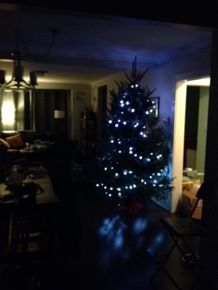 Cousin R and I found this Fraser fir at Fiesta Farms (sourced mainly in Ontario). I also didn’t want to run out and buy cheap, disposable ornaments that would wind up in the trash in no time. 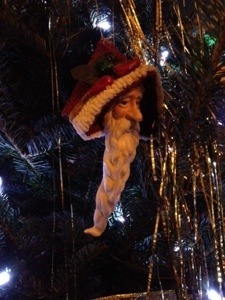 So my friend Jake offered up her collection of Santas, acquired as gifts from her mom over the years. 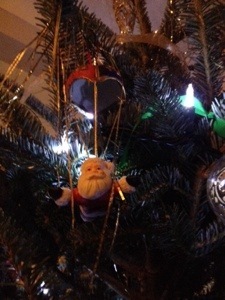 The result: our first holiday tree decorated in gold, white and red santas!! 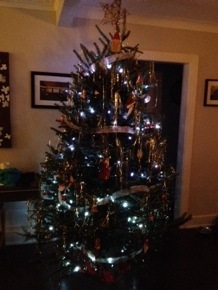 With Cousin R’s help as well as T&D’s, we got the tree inside and properly set up. R took care of the lights and I’m still meant to craft some large white flowers as accents and a frilly skirt.